SUPERSWEET : HARRYS GYM FREE CD! Packing burlier and dark haired men than expected in the sweet voiced Norwegian act, it’s no wonder we did the ahhhing head-nod once we learned of their name, Harrys Gym. 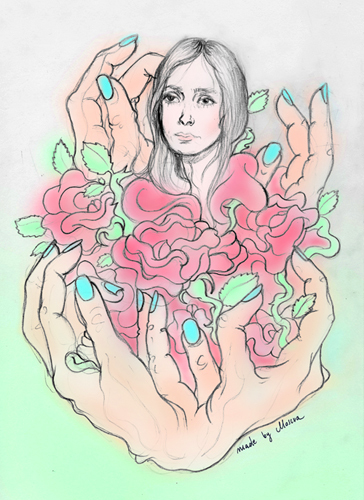 Fronted by the waif Anne Lise Frøkedal (interpreted in the stunning illustration above) the band (who broke through only in spring with their debut album) is still ringing time on SUPERSWEET’s playlist. The candy-laced melodies, which at points deliver more of a ferocious bite than others, gave us the buzz to inflict more and more readers with their tunes. Yes, we happy to part with the gem, so just answer the following question below to grab your hands on our first-hand promo album. Q: Who out of Grinderman prefers playing live than recording in the studio? Answers on our Monkey Postcard, include your name and postal address, Princess Michael de Babioshka will choose one lucky winner! Deadline is 30th November 2010. Good luck!